A bridle buried with a warrior horseman more than 1700 years ago employed the earliest known example of a bronze B-shaped buckle not commonly seen in the region for another 200 years. The bridle was removed from a burial mound in the Southern Urals which the researchers, Krivosheev Mikhail Vasilyevich and Lukpanova Yana Amangeldievna, said belonged to a warrior rider from the Late Sarmatian culture. The Sarmatians were a confederation of Iranian people who spoke Scythian, an Indo-European language from the Eastern Iranian family. 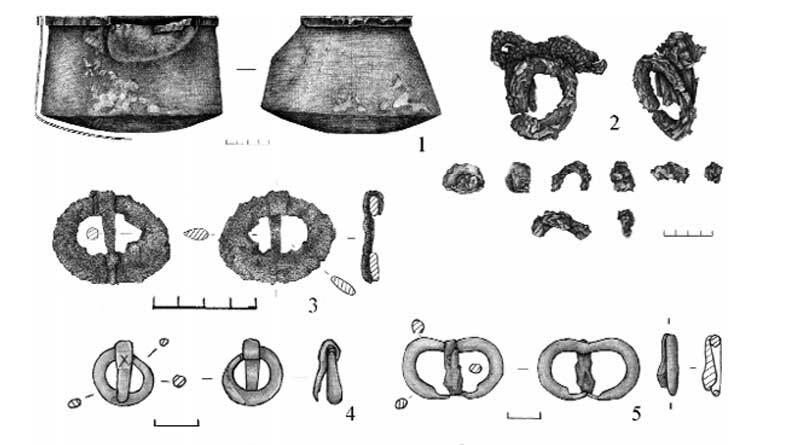 The pair, writing in the Volgograd State University publication Vestnik Volgogradskogo Gosudarstvennogo Universiteta, reported on the discovery in the burial mound of a horse bridle, a set of bladed weapons consisting of a long sword, dagger and knife, as well as a small bronze cauldron. They dated the grave to the second half of the 3rd century A.D.
“This burial belongs to elite funerary complexes of Late Sarmatian culture,” they said, saying the grave was that of a professional warrior. It was, they reported, an elite military burial. The tradition of burying warrior horsemen of high social status almost disappeared in the Volga-Don steppes after the middle of 3rd century A.D., the pair noted. In the Southern Urals, the existence of traditional hierarchies of Late Sarmatian society continued until the end of the 3rd century A.D. The pair noted the bronze B-shaped buckle employed in the bridle. Krivosheev is with Volgograd State University; Lukpanova is with the West-Kazakhstan Center of History and Archaeology. The abstract, published under a Creative Commons License, can be read here.